General Electric Co. needs more than one good set of numbers. reported adjusted earnings of 16 cents a share, beating already heavily lowered expectations that many thought it might still miss. Credit is still due for the better-than-expected results. If GE can avoid dropping bad news on its conference call — where last quarter it disclosed an SEC investigation into its accounting practices and has in the past subtly walked down guidance — its stock might just end up with a gain on earnings day for a change. The shares rose more than 5 percent in pre-market trading. Industrial operating profit was $3 billion in the quarter, with all but the lighting unit earning more than the average of the three analysts’ estimates compiled by Bloomberg Gadfly. GE affirmed its guidance for 2018 in its earnings press release, but has previously said it’s tracking toward the low end of its $1 to $1.07 adjusted EPS goal. Even with these better-than-expected first quarter numbers, meeting its target would seem to require a heroic feat. 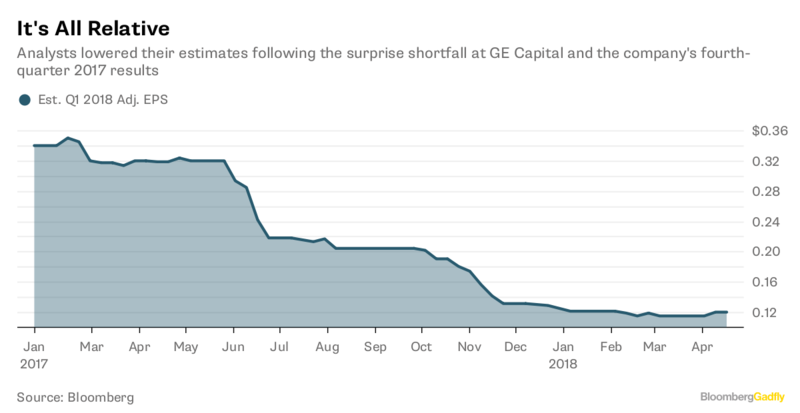 The guidance has been cast in doubt after GE reported 2017 results for its power unit that were significantly worse than it had projected and disclosed a $15 billion reserve shortfall at a legacy insurance business within GE Capital. In an update last week, GE reduced its reported 2017 industrial profit by $2.5 billion because of an accounting rule change. It was a relatively mild event in principle because of the nature of the restatements, but, as I noted at the time, the restatement lowered the starting point from which GE has to grow earnings in 2018. That means it will likely need to exceed the 2 percent to 7 percent industrial growth target it laid out in November to reach its goal. The profit reduction alone — about $400 million more than GE had projected — implies about a 4-cent hit to EPS, according to JPMorgan Chase & Co. analyst Steve Tusa. Goldman Sachs Group Inc.’s Joe Ritchie echoed that sentiment. GE may yet pull it off. The 26 percent growth in aerospace profit for the quarter stands out, particularly after the earnings restatements showed there was virtually no earnings growth in that purported powerhouse segment in 2017. But it’s going to be a challenge. More broadly speaking, from a valuation perspective, GE trades at about 13 times its projected 2018 Ebitda as calculated by Bloomberg, essentially in line with Honeywell International Inc. GE reported an organic revenue decline of 4 percent in the first quarter, whereas Honeywell, which also reported earnings on Friday, said revenue excluding the impact of currency swings and acquisitions grew 5 percent. One other point to note: GE recorded a reserve of $1.5 billion in connection with the Justice Department’s investigation into its WMC subprime mortgage business over potential violations of the Financial Institutions Reform, Recovery, and Enforcement Act. The reserve is bigger than some analysts had forecast, but, as with most things at GE these days, it’s better to have some kind of number than lingering uncertainty. Getting this matter resolved would go a ways toward easing investors’ discomfort with the ongoing black-box nature of GE Capital. Investors still need to brace for a possible goodwill writedown related to the purchase of Alstom SA’s energy assets — and the SEC investigation is still ongoing. But all in, GE made some good progress this quarter on what is still going to be a long journey.